Every day, the number of homes, schools, playgrounds, fields, and commercial areas that use synthetic grass increases, and it’s not that hard to see why. After all, synthetic grass has dramatically reduced the water consumption of heavily populated cities. Synthetic grass, however, differ in quality and types so you need to choose the one that best fits your needs. When buying synthetic grass, it’s important to understand the commonly used terms to help you assess their overall quality. Simply put, pile height is the length in inches of the longest blades. The ideal pile height will depend on how you plan to use it. For residential lawns, the ideal pile height should be around 1.75 inches. For athletic fields, however, a pile height ranging from 2.25 to 2.5 inches should be enough. The ideal pile height for golf courses is significantly shorter, ranging from 0.375 to 1.25 inches. This term, on the other hand, denotes the number of ounces of yarn used per square yard of the synthetic grass. Just like in carpets, artificial turf is softer to the touch if more yarn is used per yard. Generally, artificial turf with heavier face weights are more expensive. Both the turf’s face weight and pile height affect its matting effect, or how well the blades bounce back when pushed down. 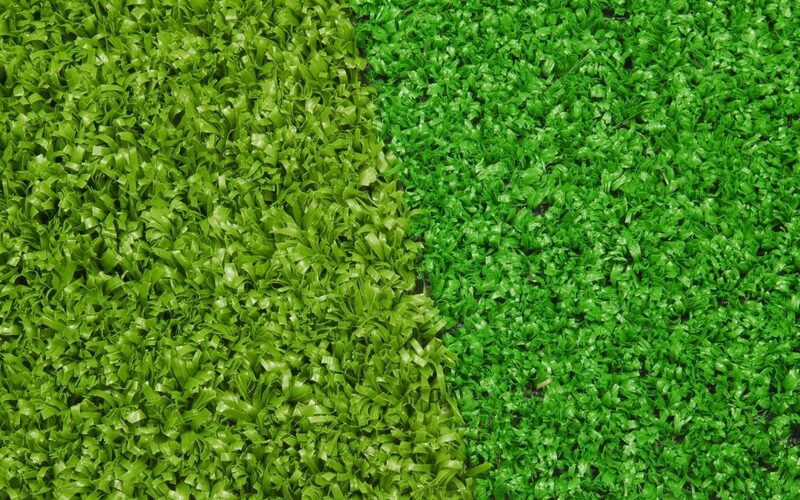 Typically, there are three types of yarns used in making artificial grass: polyethylene (PE), polypropylene (PP) and nylon. Each yarn is made of specific plastic material with very distinct physical and chemical characteristics. PE is the most commonly used material, since it gives a nice balance of durability, softness, and aesthetics. Nylon, on the other hand, is considered as the most porous and is not recommended for areas where children and pets would play. PP is the least expensive of the three, though the least durable. Too often, yard owners hire a cheap contractor to install their artificial grass only to find the everything is done haphazardly. Hiring a professional installation service will prevent any additional expenses on materials and labor needed to correct all the improper and awkward fittings done by an inexperienced contractor. Simply knowing the meaning of the commonly used terms can actually help you in making a wiser synthetic grass choice. Once you’ve taken your pick, make sure to hire only an experienced artificial grass installation service provider.